Sound engineers Daniel Reis and Beto Neves, from Brazilian Outside Broadcast company Mix2Go, pictured with their Focusrite RedNet units. 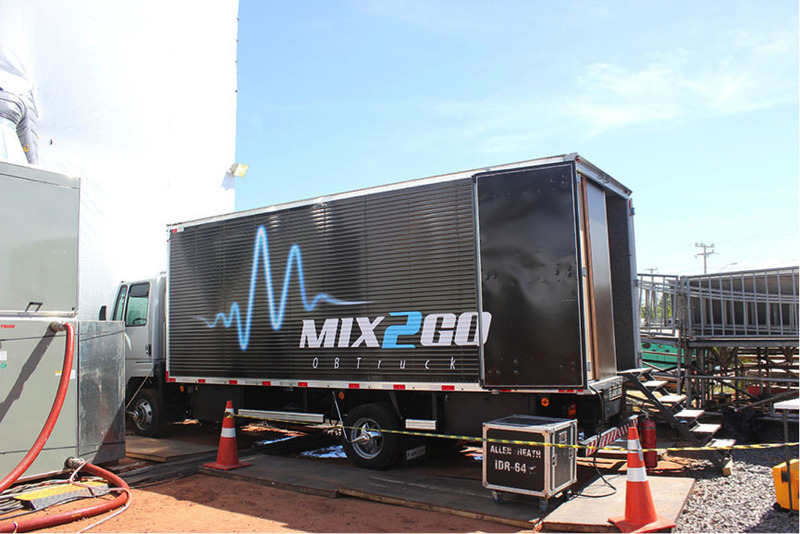 The broadcast truck of Brazilian Outside Broadcast company Mix2Go, equipped with Focusrite RedNet units. Los Angeles, CA, May 5, 2014 – Focusrite's RedNet range of network audio interfaces are playing a key role in the live broadcast and recording of some of Brazil's biggest entertainment events. Recently, Brazilian outside broadcast (OB) company Mix2Go invested in multiple RedNet units as part of their wider digital audio/visual network for the broadcast and recording of the 2014 FIFA World Cup Final Draw event. Mix2Go use a RedNet 2 16-channel A-D/D-A interface, the RedNet 3 32-channel digital I/O, a RedNet 6 MADI Bridge and three RedNet PCIe cards. “I need to give the option of delivering the program through MADI, AES/EBU or analog,” says Daniel. For the FIFA World Cup Final Draw, the team decided their RedNet 2 was an excellent choice to deliver the final live mixes to the video OB truck. They also used their RedNet 3 as an additional monitoring reference via the AES/EBU outputs. Incorporating the RedNet gear into their somewhat complex setup was incredibly fast and simple, thanks to the straightforward nature of the Dante network and the rock-solid reliability of the RedNet interfaces. “Installing RedNet was very fast – plug-and-play – and almost idiot proof,” Daniel recalls. One of the main benefits of using RedNet, and the wider Dante network, is its ability to send large amounts of audio over long distances with minimum cabling. The setup for the Final Draw event consisted of a large Dante network that linked two OB trucks parked in different locations outside the venue to the main stage. Two stage boxes (one primary and one backup) were located in the main arena, connected to gigabit network switches using Cat-6 cables. Signals from this stage rig were sent via multi-mode fiber cables to another pair of switches inside the music OB truck, about 150ft (50m) away. Inside the truck, the fiber signal was converted back to Ethernet and routed to two Mac Mini computers, which handled the multi-track recording, using Pro Tools and Audinate's Dante Virtual Soundcard (DVS) driver. The signals from stage were also routed simultaneously to the live mix console, from where the final broadcast stems were then routed to RedNet 2, located inside the video OB truck, about 100ft (30m) away. Here, the stems were converted to analog then mixed with the rest of the event’s audio and added to the final video feed, which was then sent to a distribution truck to be broadcast to television stations all around the world. To check out Mix2Go and some of their other projects, head to www.mix2go.com.br. 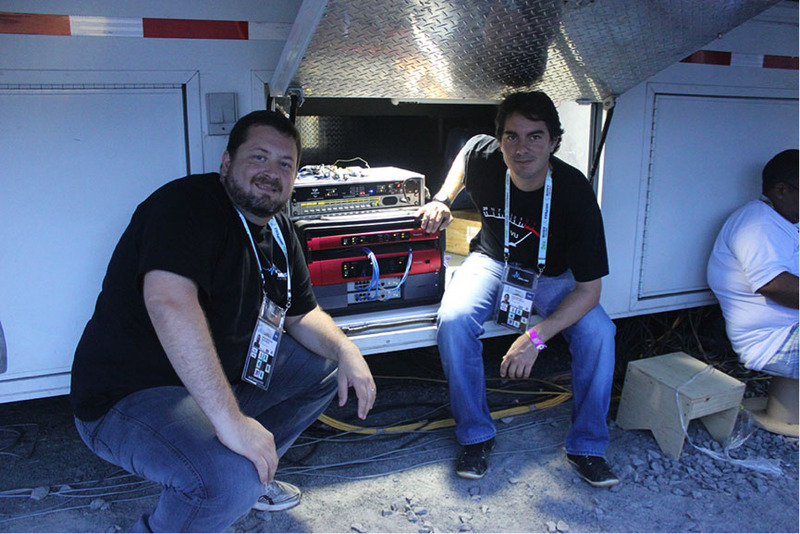 Photo Caption 1: Sound engineers Daniel Reis and Beto Neves, from Brazilian Outside Broadcast company Mix2Go, pictured with their Focusrite RedNet units. Photo Caption 2: The broadcast truck of Brazilian Outside Broadcast company Mix2Go, equipped with Focusrite RedNet units.